Contact with the Pokémon may cause infatuation. All the Pokémon’s moves become the Normal type. Makes status-changing moves more likely to miss. X It dislikes dirty places. It often searches for a comfortable place in which to groom itself. X Hasst schmutzige Orte. Behagt ihm ein Platz, fängt es sofort an, sein glänzendes Fell zu pflegen. X Il déteste la saleté et passe son temps à entretenir sa fourrure, confortablement installé. X No soporta los lugares sucios. Le encanta acicalarse el pelaje cuando está a gusto en un sitio. X Detesta gli ambienti sporchi. Se ne sta sempre ad allisciarsi la pelliccia in luoghi accoglienti. X 더러운 곳을 아주 싫어한다. 편안한 곳에서 늘 털을 다듬고 있다. Y It is highly popular among female Trainers for its sublime fur. It does not keep a nest. Y Dieses Pokémon ist bei weiblichen Trainern aufgrund seines Fells beliebt. Y Les femmes Dresseurs raffolent de sa sublime fourrure. Il ne possède pas de nid. Y Tiene mucho éxito entre las Entrenadoras por su suave pelaje. No vive en un sitio fijo. Y Ha successo fra gli Allenatori di sesso femminile per la sua bellissima pelliccia. Non ha una tana fissa. Y 아름다운 털을 가지고 있어서 여성 트레이너들에게 매우 인기 있다. 정해진 거처를 갖고 있지 않다. Omega Ruby Delcatty sleeps anywhere it wants without keeping a permanent nest. If other Pokémon approach it as it sleeps, this Pokémon will never fight—it will just move away somewhere else. Omega Ruby Enekoro schläft dort, wo es ihm gefällt und hat kein dauerhaftes Nest. Nähern sich ihm andere Pokémon, wenn es schläft, kämpft es nicht mit ihnen, sondern zieht weiter. Omega Ruby Delcatty peut dormir n’importe où. Il n’a pas de nid permanent. Lorsque d’autres Pokémon lui cherchent des noises pendant son sommeil, il ne répond pas et se contente de partir dormir ailleurs. 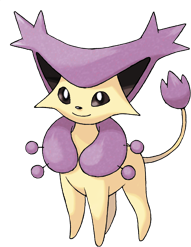 Omega Ruby Delcatty duerme en cualquier lugar sin tener que mantener el nido en un mismo sitio. Si otro Pokémon se le acerca mientras duerme, no se pondrá a luchar con él; simplemente se irá a otro sitio. Omega Ruby Delcatty dorme dove più gli aggrada senza mai una dimora fissa. Se gli si avvicinano altri Pokémon, Delcatty non lotta mai, ma leva le tende e si sposta da un’altra parte. Omega Ruby 일정한 거처 없이 생활하는 포켓몬이다. 다른 포켓몬이 잠자리에 가까이 다가와도 절대 다투지 않고 이동하여 잔다. Alpha Sapphire Delcatty prefers to live an unfettered existence in which it can do as it pleases at its own pace. Because this Pokémon eats and sleeps whenever it decides, its daily routines are completely random. Alpha Sapphire Enekoro liebt seine Eigenständigkeit. So kann es das tun, was es möchte, und kann selbst das Tempo bestimmen. Da dieses Pokémon schläft und isst, wenn es Lust dazu hat, ist sein Tagesablauf eher zufälliger Natur. Alpha Sapphire Delcatty préfère vivre une existence sans contraintes, au cours de laquelle chacun pourrait faire ce qu’il veut. Comme ce Pokémon mange et dort quand il le décide, son rythme de vie est totalement aléatoire. 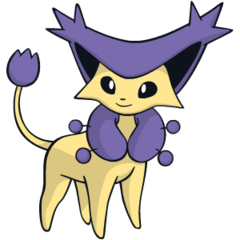 Alpha Sapphire Delcatty prefiere llevar una vida independiente y hacer lo que se le antoje. Como este Pokémon come y duerme según vea en cada momento, no se puede decir que tenga unos hábitos regulares en el día a día. Alpha Sapphire Delcatty preferisce vivere una vita in libertà, in cui poter fare ciò che più gli aggrada in base alle proprie esigenze. Poiché anche gli orari dei pasti e del sonno sono completamente liberi, la sua vita quotidiana è casuale. Alpha Sapphire 자기 방식대로 자유로운 삶을 즐긴다. 마음 내키는 대로 먹이를 먹고 잠을 자기 때문에 하루의 리듬이 제각각이다. Ruby Delcatty prefers to live an unfettered existence in which it can do as it pleases at its own pace. Because this Pokemon eats and sleeps whenever it decides, its daily routines are completely random. Sapphire DELCATTY sleeps anywhere it wants without keeping a permanent nest. If other POKeMON approach it as it sleeps, this POKeMON will never fight - it will just move away somewhere else. FireRed The favorite of trend-conscious female TRAINERS, they are used in competition for their style and fur. LeafGreen The favorite of trend-conscious female TRAINERS, they are used in competition for their style and fur. Emerald Rather than keeping a permanent lair, it habitually seeks comfortable spots and sleeps there. It is nocturnal and becomes active at dusk. Diamond It is highly popular among female Trainers for its sublime fur. It does not keep a nest. Pearl It is highly popular among female Trainers for its sublime fur. It does not keep a nest. Platinum It is highly popular among female Trainers for its sublime fur. It does not keep a nest. HeartGold It dislikes dirty places. It often searches for a comfortable place in which to groom itself. SoulSilver It dislikes dirty places. It often searches for a comfortable place in which to groom itself. Black It is highly popular among female Trainers for its sublime fur. It does not keep a nest. White It is highly popular among female Trainers for its sublime fur. It does not keep a nest. Black 2 The reason it does not have a nest is that it simply searches for a clean, comfortable place then sleeps there. White 2 The reason it does not have a nest is that it simply searches for a clean, comfortable place then sleeps there.